2020 ITS goes beyond the traditional standard of creating prep charts based on the startup forecast for the day. HyperPOS™ provides this traditional information through printable Prep Charts to start the day. 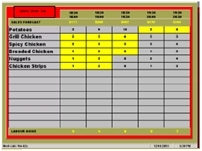 The HyperPOS™ Dynamic Kitchen Prep feature goes a step further and provides an on screen prep chart that automatically and dynamically adjusts (self corrects) to the real time actual sales experience during the day rather than simply holding to the startup forecast for the day. Imagine a system that instructs your kitchen staff exactly when to start preparing more items, even if your forecast is high or low. This is exactly what the HyperPOS™ Dynamic Kitchen Prep feature provides. The 2020 Dynamic Kitchen Prep display will automatically increase or reduce the recommended prep amounts based on real time live data, while still considering appropriate sales history. Real time prep calculations create more accurate prep requirements, reduce waste and improve service times. Restaurant owners have indicated that this single feature alone reduces food cost between .50% and 0.75%. With the Dynamic Kitchen Prep option, you will automatically adjust to actual sales tracking different than the opening forecast. Your customers will appreciate the true availability of your product and speed of service. 2020 ITS's dynamic real time kitchen prep system is just one example of the leading edge restaurant technology 2020 ITS provides. With our prep charts, projected prep and real time POS data integration, over-prep waste (and costs) and under-prep issues (slow service) are eliminated. Let 2020 ITS help you reduce waste, ensure optimal freshness and increase speed of service.